If you’re between 19 and 64, book your free vision exam today! Live life in high-definition! 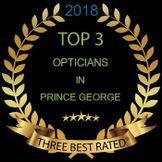 Savers Optical Ltd offers a variety of the best contacts, sunglasses and glasses Prince George has to offer. For over 40 years, our licensed opticians have helped customers to “see the savings” in their contact lens and eyeglass purchases. You don’t need particular wealth for perfect ocular health! Are you a first-time visitor with lots of questions? We offer eyeglass repairs, contact fittings and more! We bring you the latest eyewear fashions at unbeatable prices! We’re dedicated to ensuring your complete satisfaction. While clear vision is always en vogue, you’ll simply love being seen in our designer frames from brands such as Versace, Guess® and D&G. View our complete line of designer frames and related accessories! As full-service opticians, we also offer vision exams and contact lens fittings, as well as on-site eyeglass repairs. Many of our services can even be completed within the hour! Sometimes when it comes to selecting eyeglasses and eyewear, your vision may have been 25/25. While hindsight is always 20/20, proper foresight is always rewarded with our everyday 2-for-1 specials for eyeglasses! We also have kids’ packages available, as well as discounts for students and seniors! Call today to book your free vision exam! Our licensed opticians are proud members of the College of Opticians of British Columbia.